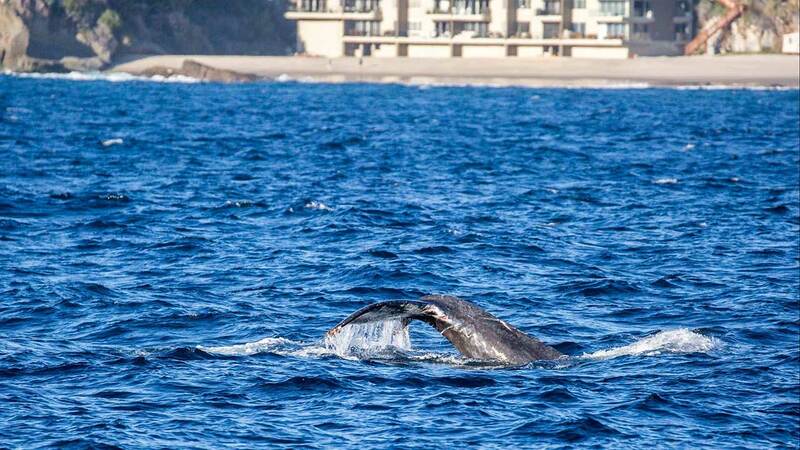 Friday, Oct. 30, 2015, photo courtesy of Facebook.com/Slater Moore Photography and newportwhales.com, shows an entangled humpback whale off the Southern California coast. LONG BEACH, Calif. -- Rescuers on Saturday managed to free a humpback whale entangled in hundreds of feet of fishing line, and it swam away southwards. "We hope we gave this whale a second chance at life," said Kelly Terry, a spokeswoman for SeaWorld in San Diego, which sent a rescue team to free the huge mammal. A team with the National Oceanic and Atmospheric Administration was able to cut away up to 100 feet of rope and buoys - possibly from a lobster trap - but the whale became agitated and dove deep, eluding rescuers for the rest of the day. The whale is believed to be the same creature that was seen struggling with ropes several days ago off Santa Barbara, about 75 miles northwest of Los Angeles, said Justin Viezbicke, a NOAA program specialist who was part of Friday's rescue effort. NOAA's whale rescue team has responded to about 50 entangled whales since January - a spike that could be attributed to warmer waters bringing the giant animals closer to shore, where they encounter fishing gear, Viezbicke said. "Our response network is really just a Band-Aid," Viezbicke said. "We're looking for ways to be proactive and minimize these situations in the future."